The BluePrince Help button is located at the bottom of the BluePrince Main Tool Bar (see Figure 122). Click on the Help button to reveal a sidebar menu with options that are available to help you if you have a problem or question about the BluePrince software (see Figure 123). If you need technical support, a member of the BluePrince technical support staff may ask you what version of the BluePrince Client you are using in order to better assist you. 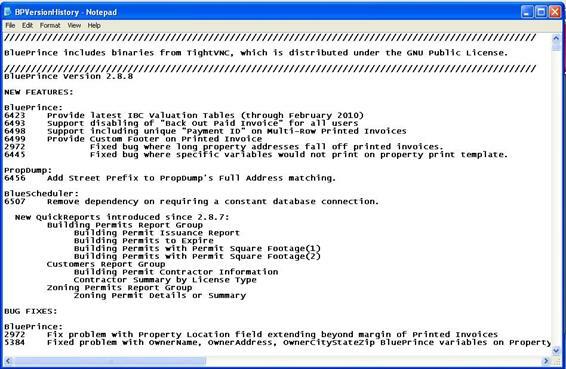 This information can be easily viewed from the top of the help menu (for this example, the version is 2.8.8.27). There are 5 buttons on the BluePrince Help menu. Their actions are described in the remainder of this section. While helping you with a Trouble Ticket, BluePrince technical support may request additional information to be sent from your client application. If they request a Debug Log, click the Send Debug Log button and the information they need will be directly transmitted to them. 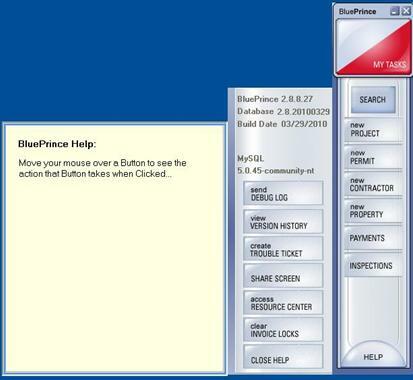 Periodically, BluePrince will release an upgrade to the BluePrince software. The Version History button allows you to see a complete list of changes that have been made between the last version of BluePrince and the current version (see Figure 124). One of the fastest ways to get in touch with technical support is to click the create Trouble Ticket button. When you click on this button your web browser opens on a web page that asks for your email address, the urgency of your problem, problem area (what part of BluePrince you have a question about), and details about the problem or question (see Figure 125). 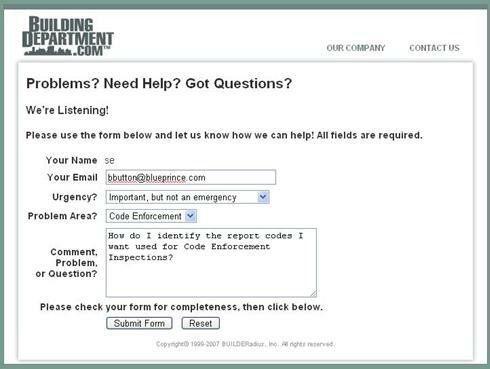 When you are finished with your question, press the Submit Form button at the bottom of the form. If you accidentally type something wrong and want to start over from scratch simply press the Reset button and all of the information you entered will be cleared. The Share Screen button allowed you to share your screen with a member of the BluePrince technical staff. This method of support is highly effective in locating and troubleshooting any question or problem you may have. This technology is no longer used; instead, a member of our BluePrince technical staff will initiate a GoToMeeting and you will be asked to join the meeting so that your screen may be viewed by technical staff. An important source of information for your staff is the online BluePrince Resource Center. The resource center allows you to download the newest version of the software and to link to BluePrince University, where you may watch detailed BluePrince training videos, recorded webinars, or visit the User Forum. Click on the Access Resource Center button to launch the resource center in a web browser. Once you have arrived at the login page, login according the instructions given to you by your Systems Engineer. When you are finished with the help menu, click the Close Help button at the bottom of the help menu to return to the BluePrince Main Tool Bar.